Run, dream. Run on into the daylight. And walk into reality. Note: Just a short “what if” I wrote that has randomly turned into yet another full-blown multipart fic that will never get finished. Just throwing it out b/c of the sad lack of FFX fics in general right now (declining fandom?? TT_TT). EDIT: Sorry, my layout now makes italics blue if you view it within the layout. :( Not intended. But just click the link to the post, should be ok. I've been searching for ... well, ever. 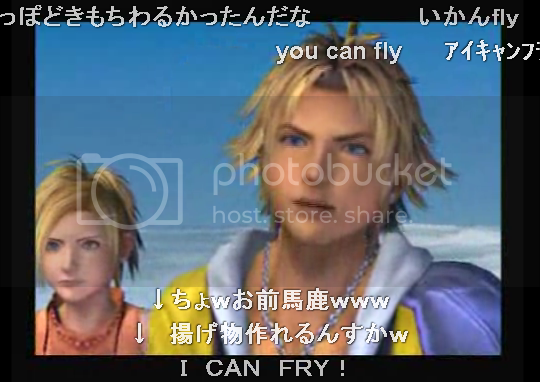 But I finally was able to locate videos of the cutscenes from the Japanese version of FFX. And I was on the verge of purchasing the NTSC-J version of FFX at an exorbitant import price, too, just to see them, so this is especially awesome. **NOTE!! This is a teaser I posted a while ago. See here for the full version. Note: Just a very short prelude of a “what if” I wrote just now when I was trying to work on another S/Y fic XD ... going continue if I get inspiration. Just throwing it out b/c of the sad lack of FFX fics in general right now (declining fandom?? TT_TT). Top left pic makes me have serious Fullmetal Alchemist military deja vu. Pics from Random Curiosity. OK, so I read about this one series from Studio Gonzo, called Pumpkin Scissors (just ignore the silly name; if you liked the military cast in Fullmetal Alchemist or like not-too-gritty early-1900s-esque military anime, you'll like it). It sounded exactly like something I'd like, so I watched it on crunchyroll and veoh (you have to register and turn off the parental controls to see it on veoh, though). And lo, it was awesome. Because very, very few anime catch my attention like this these days, I immediately looked it up all over the place to check out the Pumpkin Scissors fandom. Being the fangirl that I am, I was really excited because totally thought it would have a decent-sized English following since it came from Gonzo and is pretty likable. And then... surprise! There's only a very small following (about 60 people on LJ), and little to no actual fandom. But now I really like Pumpkin Scissors. For me, it's just that it has a lot of cool subject matter and interesting plot ideas (that I have the oddest feeling will never be fully developed by the end of the show). I could be working on fics. But. angel_ray made me do it. Really. ... in addition to severe ADHD and lots of studying to do is not good for finishing fics. So, I decided to make a list of things that I am most definitely going to prioritize and finish sometime within the next month. After the 1-sentenceand Desperate Measures, I really want to work on those last two. There aren't very many Lu Bu/Diao Chan fics and no Yakuza fics at all. And about my other unfinished fics, specifically Strictly Business and Undeniable ... well, the former didn't come out the way I wanted it to (it was supposed to be much darker and less ... stupid), and the latter ... I don't know what to write. ;_; Someday, though, I'll either do a re-write or a totally different S/Y fic.